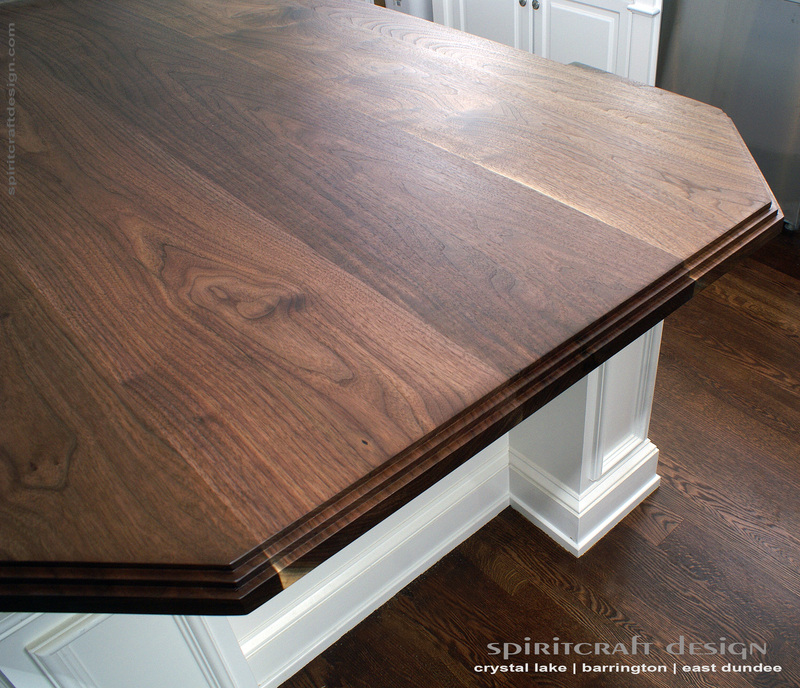 This installation of a large solid Black Walnut Island top was installed into a kitchen in Glenview, Illinois. The long slab top was crafted in two seven foot by four foot sections to create a stunning 14″ long top that features a stove cutout in the center. The hardwood in this slab top installation is perfectly clear, without any imperfections and was crafted from thick wide boards from a single stormed downed tree that once lived in Galena, Illinois. To reflect details in this kitchen, we created a stepped edge on both ends of this slab top which adds interest and an appeal that will stand the test of time. Our custom natural oil and varnish mix was employed to create an enduring and beautiful finish that offers silky smooth protection while allowing the feel of this beautiful Walnut to remain apparent to the touch. Our island tops and slab table tops are made from wider boards and can be cut in nearly any shape, machined to be rectangular or left with a “live edge” which depicts the natural shape of the tree. Many of our tops are made from book-matched slabs meaning that a very thick slab is sliced in half and opened to provide a beautiful mirror image of Nature’s handiwork. Our hardwoods are incredible and come from small local sawmills who give trees the respect trees they deserve. Walnut, Maple, Ash and Cherry make for beautiful Island tops that will enhance any kitchen design and decor style. Our slab table tops are crafted from local hardwoods and are made from slabs that came from large storm downed trees. This provides a higher quality hardwood in terms of grain, texture and color being that the wood comes from larger and older trees that what is commercially available. We call these fine and very high quality hardwoods “rescued” as they are taken from trees that have lived a full life and are given the chance to live on while being fully appreciated for their unique beauty. Detail of Black Walnut – click image for large view. 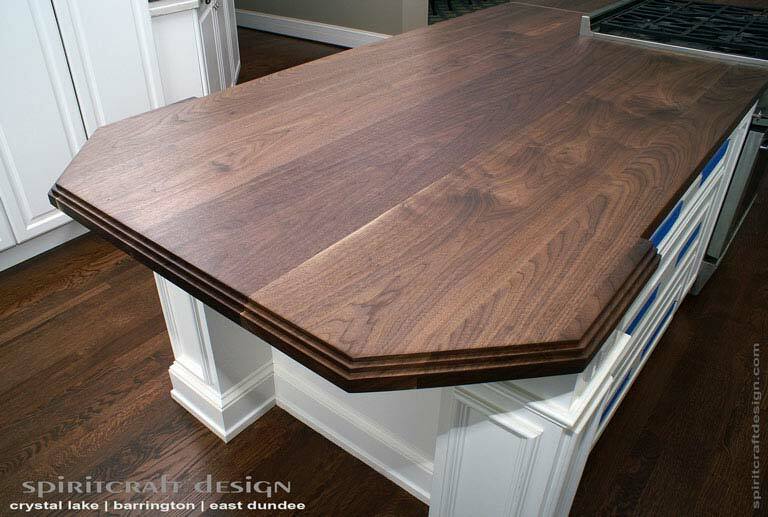 We offer slab table and island tops in a variety of local hardwoods and in any size imaginable. 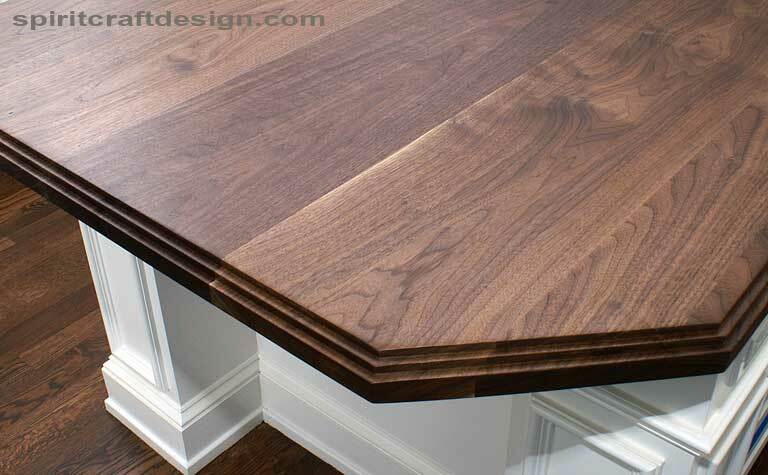 As solid hardwood furniture makers, we know hardwoods and provide the finest quality tops available. Our hardwoods are expertly kiln dried and our large industrial surfacing equipment allows for perfect glue joints which assure endurance and lasting beauty. Our solid hardwood tops are available in our original collection of furniture and as conference, dining and restaurant table tops, decorative book-matched wall art and kitchen island and counter top applications. We ship our original designed furniture collections and hardwood tops nationally and deliver and install our products within our local service areas of Crystal Lake, Barrington and the greater Chicago area of Illinois as well as from our design center in East Dundee, IL. 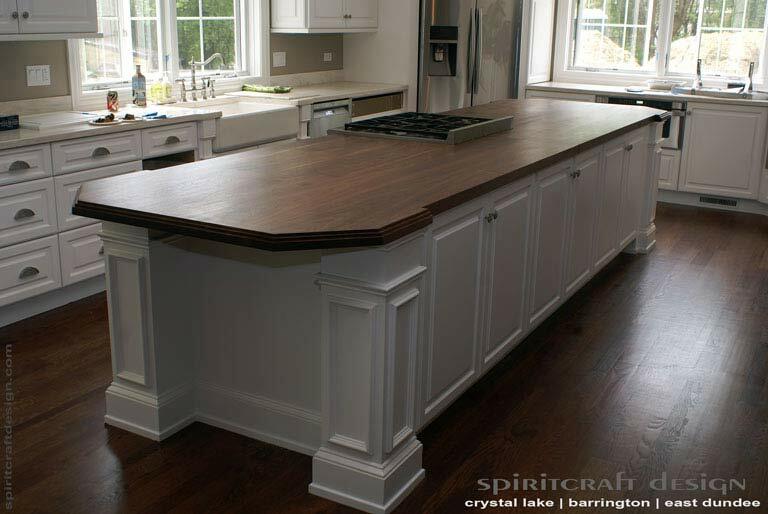 Call us at 815-893-6609 or email skip@spiritcraftdesign.com to discuss your interior decor and how our solid “rescued” hardwood table and island tops can beautify your kitchen, home decor or commercial space. Serving the Chicago area and suburbs from our Crystal Lake, IL main office, and the Barrington and Arlington Heights from our East Dundee design center and work space.